Schrauwen, with its headquarters in Herentals, Belgium, delivers an extensive range of equipment and parts to installing companies, 11 of its own shops, and private customers. 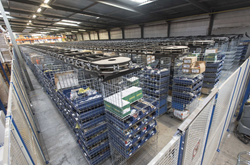 Sustained growth and the move to overnight delivery required a more flexible and efficient order picking solution for reliable delivery to the customer than the existing static shelving. For the 15,000 stockkeeping units (SKUs) varying in size and weight, suitable types of storage systems are needed. For approximately 5,000 small parts in bins and cartons, Schrauwen consolidated inventory into six horizontal carousels from Kardex Remstar. Pick-to-light and put-to-light systems combined with batch picking operations allow 20 orders to be picked up at the same time by one operator. In general, at Schrauwen, two operators work on the orders, but in peak times, the number can be increased up to six, only with easy registration to the warehouse management software from Kardex Remstar. At Schrauwen, the goods-to-person principle and significantly reduced travel time resulted in a substantial increase in picking speed. The warehouse management system from Kardex Remstar is linked to the customer’s ERP system, where receiving of goods is processed and customer orders are created. Then, the Kardex software assigns SKUs in the horizontal carousel as well as in all other storage locations, reports all actions back to the ERP system, and keeps track of storage levels, ensuring full stock control. With this solution, Schrauwen can process 2,000 order lines per day and prepare customer orders for around 100 deliveries per day, performed by nine company trucks, including special night delivery. Kardex Remstar, LLC, a company of the Kardex Group, is a leading provider of automated storage and retrieval systems for manufacturing, distribution, warehousing, offices and institutions. For information about our dynamic storage solutions, call 800-639-5805 or visit http://www.kardexremstar.com.